MORGAN Tsvangirai wanted to step down as MDC-T president soon after he lost to President Robert Mugabe for the third time in the July 31 polls, sources said yesterday. 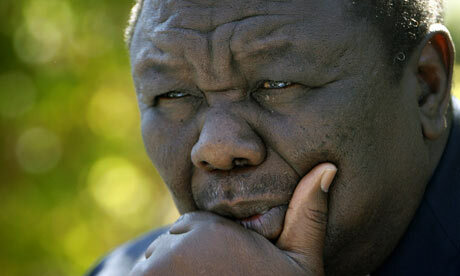 Tsvangirai has been using different platforms to declare that he would not be stepping down before his term ends in 2016. However, reliable sources said the former Zimbabwe Congress of Trade Unions secretary-general reportedly proposed a special congress to allow the party to choose a new leader during an MDC-T standing committee meeting held soon after the harmonised elections. His shock decision was reportedly influenced by senior party officials who started calling for him to step down, albeit in hushed tones. His lieutenants reportedly shot down the idea of a special congress fearing they would send conflicting signals about their stance that the harmonised elections were rigged. MDC-T spokesperson Douglas Mwonzora yesterday confirmed that Tsvangirai’s succession had become a hot potato in the party. But he dismissed reports that the MDC-T’s leadership was trying to silence dissenting voices through suspensions and disciplinary hearings. “No one is being disciplined for talking of leadership renewal, the problem is not who said it or who talked about it, it’s about jumping protocol,” he said. Mwonzora said the issue of leadership renewal had been discussed in the party’s national standing committee, national executive and national council. “There are people who have raised issues in the national executive, national council and various platforms and there are others who feel it’s not a good idea,” he said. “The debate has no substance. The fact that (Roy) Bennet said it and (Ian) Kay said it, doesn’t mean there are others in the MDC not saying it. Though Mwonzora could not be drawn into discussing the matter further, sources in the party said Tsvangirai made the first move and proposed to go for a special congress. “The proposal came from the president during a meeting and he was open about it,” said the source. “However, his proposal was blocked. People must realise that there would have been dire consequences had we allowed for the special congress. It would have been an admission that Zanu PF did not rig elections. Meanwhile, Mwonzora told a press conference yesterday Kay, the MDC-T’s losing candidate for Marondera Central had not been suspended from the party, but the party was unhappy with his remarks on succession being made without following proper party channels. On the suspension of mayors and councillors, Mwonzora said a team was investigating and will come up with a report on what happened in Kwekwe, Mutare, Redcliff and Victoria Falls where cases of underhand dealings by councillors were reported.